The Head of the Yamal-Nenets Autonomous Okrug confirms that more Russian Arctic railway construction is coming up. The new line will connect Bovanenkovo, the natural gas hub in Yamal, with Sabetta, the new port along the Gulf of Ob, Kobylkin told journalists this month. The line will be an extension of the 572 km long Obskaya-Bovanenkovo railway, which was built by Gazprom and opened for operations in 2009. It is today the northernmost railway line in the world. Gazprom is likely to be a key stakeholder also in the new Bovanenkovo-Sabetta line. Nenets-Yamal leader Kobylkin underlines that the project will be financed by a public-private partnership and that construction will start next year «unless problems on the external market appear». The project planning phase is completed, a press release from the regional government informs. The importance of the new railway was highlighted also by President Vladimir Putin in his major annual press conference last year. Gazprom over several years spent major sums on its Obskaya-Bovanenkovo line. It includes five stations and 70 bridges and was built by about 7,500 workers. 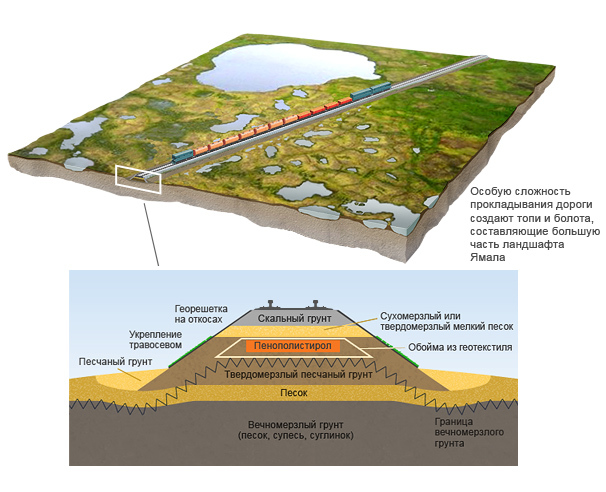 The line stretches across hundreds of kilometers of the Yamal tundra, all of it environmentally vulnerable permafrost areas. Potentially, the new 170 km long Bovanenkovo-Sabetta connection could enable Gazprom to apply the local LNG capacities currently under development by Novatek. The Yamal LNG plant is due to start production in 2017 and a second project, the Arctic LNG, is under planning. Gazprom controls huge gas reserves in the Yamal Peninsula and is in full swing with production at the Bovanenkovo. That gas is today sent by a new west-bound pipeline. However in the future, some Gazprom’s Yamal gas could be turned into LNG.